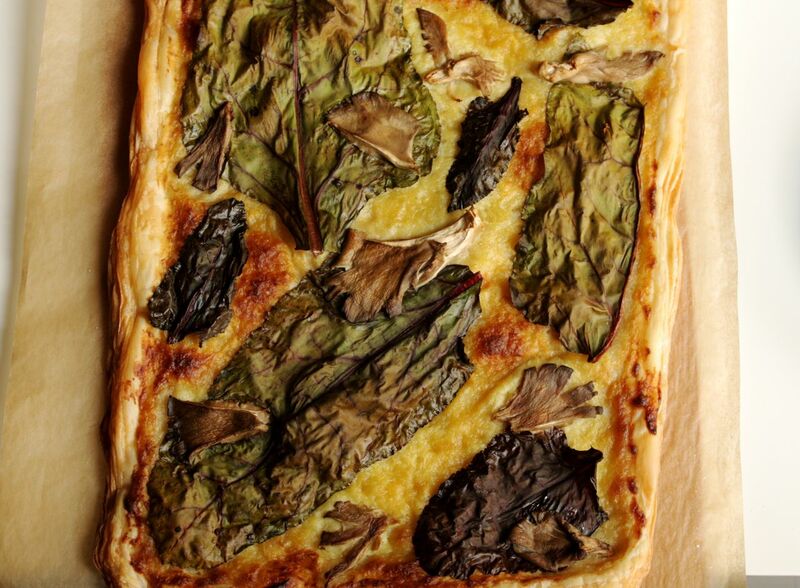 It’s just like leaves drifted right down from the trees and settled onto your tart! If dead leaves tasted like crisped chard and oyster mushrooms? Ok, maybe forget about the dead leaves part. I do like how this tart mirrors the beauty of this time of year but no one really needs to think about decomposing fall foliage on their dinner plate. Instead, lets focus on the flavour. 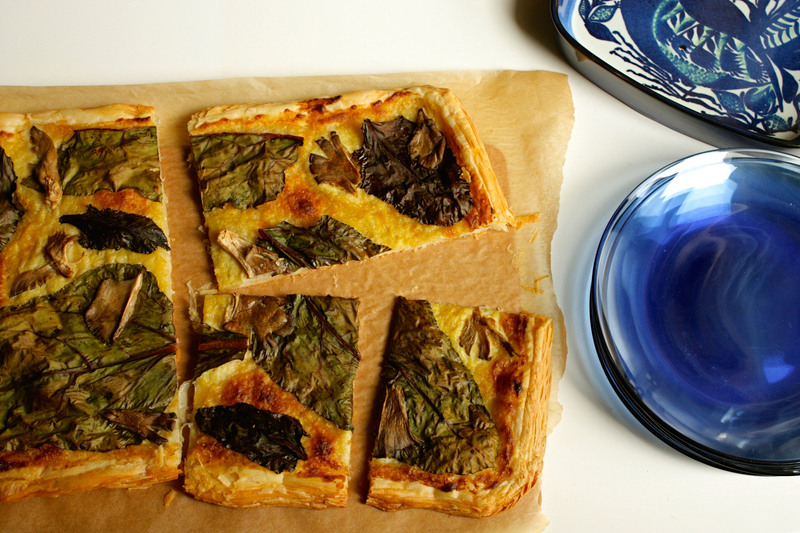 This tart is irresistible, if I do say so, and I say that as a warning, not to brag. I tried hard to control myself, since it’s pretty luscious with leek-scented cream layered onto puff pastry. But I ate more than I intended to throughout testing the recipe. It’s supposed to be the special, meat-free offering at a Thanksgiving feast. Not something to be snacked on while I do the dishes. At a special dinner, it’s a perfect indulgence, plated nicely beside roasted root vegetables, gravy and all of the other fixings. Or sliced into small slivers, it’s the best treat you could offer up with a sip of champagne to get the evening started. And let your guests be the ones to mention that yes, it really does look like the quintessential autumn tart. Nod, smile, and then steer the conversation away from decay. Quickly roll out dough on a lightly floured surface with a lightly floured rolling pin to an 11 x 18″ rectangle. Transfer to a parchment paper-lined baking sheet of the same size. Score a 1/2-inch edge around the rim of the rectangle and dock the interior all over with a fork. Spread cooled leek cream sauce evenly over the tart up to the edges of the scored rim. Lay chard leaves on top evenly (gaps are fine) and tear oyster mushrooms over top. Season lightly with salt. Bake for about 20 minutes until the edges of the tart are golden. Remove, transfer tart on parchment to a cutting board, slice into 6 pieces and serve as a main. Cut into bite-sized pieces to serve as an appetizer either warm or at room temperature. The THANKSGIVING Issue…and the PLAN!